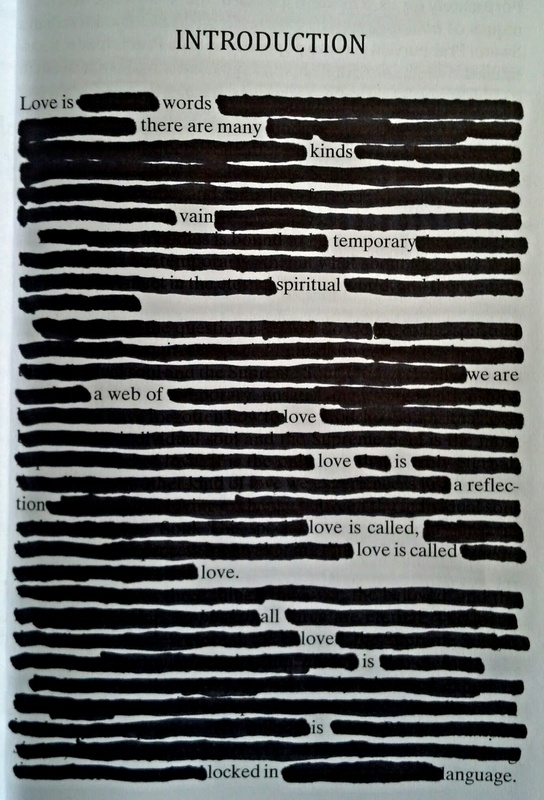 Another piece of my current erasure project! When you live in a rural area of England for enough time you eventually find the best places from which to watch sunsets. You wonder about them as you walk home to your apartment, peering through the new darkness. It is like there is something on your mind; the corners of your eyes are sensitive to places from which you can sit and look to the West. It is easy to see the horizon; England can only hide very little things. Watch the sun be enveloped by a lake. Stand on the eastern edge of a field sloping to the West. English birds don’t notice when days’ end has come. You hear songs which until now you did not realize you thought of as holy prayers for the sun. You walk home in the dark and notice wings shuffling in the tree-branches. You floated from time. You have to come back in and it will lurch painfully. You saw an endpoint and just beyond it — a land burned deep, red and blue where the day ends. When you are there, the sun is everywhere. O She holds me in the near-dark and shakes me. I see the coals reflected in her eyes, that glint; she’d like to slap me. O I hear a song; the wind-borne whistling of a fisherman ambling the Lower Thames. I haven’t spoken since I arrived. We are too tired on the bed and she’d like me to stay. Her accent is in another room. There are four doors ajar. The fifth is closed, out of reach, only visible around corners. O I fished with him, the river lapping our feet. The tongues of rats. I see him in the water once more, fishing for his pearls. The fire extinguishes, the pressure changes, the wind runs out through cracks in the room. She is too possessed to understand. I see the river-sand shifting. O We sit in the dark and quiet on the bed and a third person sits just behind her. She wants to utter me from distraction. I hear chanting. A word or three. In the dark, the room shakes. A sphere, musical, open everywhere. it wasn’t sunset but after. There was a perfect mist in the grass. everyone standing in the mist. water and air, meeting in the grass. the people standing in the mist. all of us standing in the mist. too high up to see them. Nothing, just music and leaves. I wish a day could be drawn without time. through air, into lakes, touching mud. never higher than the treetops. it can be seen from the sky. It was supposed to rain here every day. it’s just this static through the windows. opens and closes briefly, giving way. Static turns into steam, a colder season. a seagull in the fog, defending itself. wakes me up to it. Rain solidified. black, white. I open it up. Between the sun and myself on the metal railing stood two pigeons which had been made into absolute shadows. They appeared to be printed on the spherical surface of my vision, tiny birds pre-existent on my brain projected by the light of my eyes. They were momentary avatars of my ‘self-centerness’ within my world. I seemed now satellite to them: from them grew the metal railing, the deck, myself sitting and watching them, the water of The Serpentine, all of the park bounded by the expanse of my knowledge of London, then what was visible of the sky progressively unveiled by the retreating storm. As I walked I considered the notion that we experience most truly in memory, and this seemed to be accurate in some way. In certain moments, when we are ‘traveling’ say, there is a divorce between expectation, which exists ‘pre-present’, and actuality, which by its mere reality cannot stand up to imagination. In the duality between evaluation against preexistent mental world and existing physical world, actuality acquires a strange distance of its own, as if it is more unreal than how we imagined it in the first place. In remembering the event we are able to reattach the plastic of imagination though this time colored with our chosen emotion, so that it is either a fantasy or a nightmare, but either way more ‘real’ than the moment of its experience. But as I reflected on sitting by the lake and reading, it seemed to me that this notion was incomplete. There was a feeling in that present moment, unadulterated by expectation or memory; it was the ‘inside’ of what was physically before me, what I knew I would attempt to describe to myself as I walked away from it. I knew also that even during describing there was a feeling, an inside to that moment as well. This is the endless paradox of experience, lived out through the struggle of the writer: we live in the present moment and all the ones superseding it and to describe, to stand up and turn around, is to change bodies, to move through time, to lose and renew the position you looked out from a moment before, living, perpetual recrystallization.